Bro. Carlo Bacalla: Pacquiao is special because 1) He has d heart of a winner. Alex Baguio: He will beat mayweather. He has a unique rhythm. He attacks from every imaginable angle; his speed and power will provide unbearable pressure. Jonel Borromeo: Pacman will beat mayweather because he can move in and out fast. Second, its good for the nation to keep on hoping; after all its that hope that keeps us going. Raycia Eullaran: He’s a hero coz he has proven that Filipinos can rise up in adversity. With faith and hard work, we can conquer the world. Councilor Jack Jakosalem: Floyd wil be tougher than cotto coz of his better defensive tactics and quicker hands/footwork. He was once, if you recall, regarded as the most boring champion. But everyone’s looking forward to a bloodied and battered floyd by fight’s end. Manny by UD or late TKO. But then again, it took him 12 rounds to beat oscar, when pacman only needed 8, and 10 rounds to KO hatton while MP did it in 2. Rene Kintanar: His biggest impact is on the Filipino psyche. He has awakened a sense of pride of a people who has been disparaged owing to underachievement. Councilor Edgar Labella: Pacquiao never misses to express his overflowing gratitude to God everytime he wins. He epitomizes humility in the midst of success and glory. Ted Locson: He is humble and has mastered the art of self discipline. He’s able to use his God-given talents. Neil Montesclaros: Greatest? I don’t have an authoritative opinion. 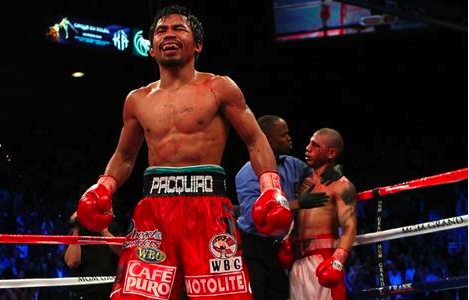 All I know is that because of Pacman, I saw boxing as an art mixing strength, intelligence, endurance, speed and skill. Dustin Morada: MP wil win (against Floyd). He’s fighting 4 a greater purpose, 4 God nd country, nt 4 money. That spells d difference. Cherry Muntuerto: What makes Pacquiao special? His strong faith in God which he readily articulates and demonstrates, his humility as seen in how he deals with his opponents outside the ring and his zest for learning. Georgia Osmeña: Manny is my hero! He is persistent, determined, disciplined and has remained humble all throughout his successes. Ray Patuasi: The best Asian boxer of all time. A man who can briefly unify a divided nation and momentarily cut the incidence of crime. Joy Polloso: Beyond giving honor and inspiration among Filipinos, Pacquiao neutralizes the Eco-class in the country and continues to stir economic activities. Jingle Polotan: His work ethic and humility. He knows how to focus on the things that needs to be done, but still treats his opponent with respect. Babylyn Roa: Of course, his smile, which exudes confidence. And his mental toughness and focus aside frm all his other strengths. Also his ‘kolokoy’ (entertaining) personality. Donald Ruiz: His strong belief in God and love of country. Bernard Sia: His humility, preparation and doing his best then trusting God. Emma Siao: Gracing the cover of TIME & earning billions is no ordinary feat. But even at the helm of his deafening success, PACMAN never forgets to bow down and acknowledge our Almighty Father for all His blessings! Dodong Sulatre: Pacquiao wil surely win over mayweather becoz pacquiao’s foot and hand speed and power cud not be equaled. Chris Tio: I have stopped doubting the pacman, as long as he stays focused, disciplined, confident and out of politics! Boy Tiukinhoy: Definitely, Pacquiao will win. After what Pacquiao did to Cotto, Mayweather will be psychologically and mentally stressed. Nick Torres: Hand speed. Foot speed. Power in both hands (even off balance). Stamina. No fear. Focus. Commitment. Weird attack angles. Defense. The greatest trainer. Humility. Always learning. Always improving. And now, a granite chin and Kevlar belly. Where’s the chink in the Pacman’s armor? Roy Trani: MP is gifted and trains hard. He does this not only for himself but also for the Filipino people!